been crucified to me, and I to the world. I was listening to a message by John Piper this morning and it was powerful. country when their brakes went out and they ran off a cliff and died instantly. devoted their life to traveling from village to village. Sharing the gospel and mending the sick. Comforting the lonely and holding small dying babies were just a few of their many task I'm sure. He asked the question of their death "Was this a tragic death?" He went on to say "absolutely not." These two women had no inheritance to leave, they didn't have the stuff to pass down to the next generation. They died not able to boast about anything except the cross. They had nothing to present to the Lord except their lives work. The next story was about a couple who worked hard their whole life. They had a plan to retire early. They worked hard and at the age of 51 and 52 they retired to the beach. They had a huge beautiful house and a great car. They collected sea shells every morning. look at our seashells. We have a huge collection. It took us years to collect all of these." Their life was tragic, their death even more tragic. Do we boast? Do we brag about the things we're good at or the area we're smart at? 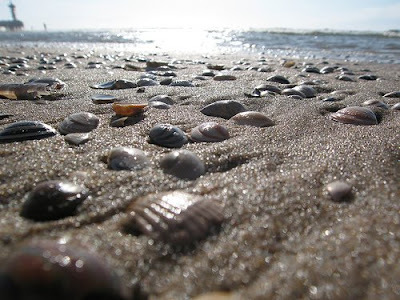 Does our homes reflect the seashells in our life? Do we build our children up to think more highly of themselves then we should? If they are prideful and get their feelings hurt easily they probably have an issue with self.. Does our life reflect the stuff we have collected or the difference we have made for the Lord? As the years go by the selfishness seems to be the race everyone is trying to win. They somehow feel they have 'earned' the right to live selfishly. they have the right to live their life the way they want to. They want no responsibility and no one to tell them what to do. They don't want to be accountable to their parents, teachers. can't take care of himself much less a wife and kids. Our society is filled with anything but boasting of the cross. Even Christian families boast about how well they "have it together." They have all the answers, unfortunately it's not the bible or the cross.
" We want you to be impressed with us or our life style, not our Lord. Our sea-shells may be different shaped but their still sea-shells. " Where does this stop?How can we make a difference? direction of home. Our boys have to be trained to be leaders not followers. We have to stop giving our kids more stuff and start giving them more time to serve others. Why do we feel so badly when our kids have to work harder than most? Is that of Christ? be able to live a selfish life like her peers" or "She will grow up to hate kids because she has so many brothers and sisters" etc. We need to put this verse on the door-frames of our houses. We need to have a copy for our cars. has been crucified to me, and I to the world." Standing before the Lord what will we bring before Him? What will our life work reveal about our heart? "We have to stop giving our kids more stuff and start giving them more time to serve others." I think serving others, like charity, should begin at home. We so agree with you Julie!! The kids have served me and each other during this past 4.5 months. They have also made time for their grand mother and great grand-mother..
Charity : The theological virtue defined as love directed first toward God but also toward oneself and one's neighbors as objects of God's love. This is the base of what we teach.